You'll be talking about your small group Ireland trip for years to come! The sights you see as you travel along the back roads of Ireland will be as unforgettable as the friends you make along the way. Enjoy this short video about the Inroads Ireland tour experience! See a beautiful scene and want to stop for a picture? No worries - you can stop whenever you'd like. Have an average fitness level and good mobility. Walking up a hill to a fantastic view sounds like fun! And if you're not in the mood that day, you can always opt out of a walk. Live each travel day to the fullest! The itinerary is subject to change to maximize your Irish travel experience. Are a variety of ages - 60% of the people on our tours are between 40 and 65 years old, 20% are younger than 40, and 20% are older than 65. They all share a love of roads less traveled and having an authentic Irish experience. The tour was casual and informative, the group size was perfect, the bus was comfortable and small enough to get onto the small roads. I felt like I got to see so many things I wouldn't have with a larger tour company that would only hit the major attractions. Our guide was VERY knowledgeable. We asked him random questions and he always knew the answers. I felt like I was traveling with friends - I've got the travel bug now and hope to be back for another tour! Every day seemed to top the prior day. Loved sitting in pubs and listening to Irish trad music. Best decision I ever made! Life changing experience. Thank you! Inroads Ireland tour operators Phil Ryan (Dublin, Ireland) and Carolyn Janette (Milwaukee, Wisconsin) have traveled extensively around the world, both independently and through various tour groups. Having always enjoyed connecting with fellow travelers, especially those that shared their love of roads less traveled, they created Inroads Ireland. With their combined passion and experience, they hope to help others explore the natural beauty, local culture, history, and traditions of a place they so treasure. As a socially responsible tour company, Inroads Ireland wants to support local economies; therefore, our tours stay in locally owned guesthouses, hotels, and B&Bs. Phil has been an Irish tour guide for many years and has explored the many twists and turns of Ireland's back roads. His expertise and his relationships with locals will help make your vacation truly unique. Inroads Ireland is a land-only tour. You will need to get yourself to Dublin and to the hotel in the city center. On our Trip Prep/FAQs page, we provide helpful tips on booking air and easy ways to get from the airport to the hotel. With Inroads Ireland, you will not feel like you are on a "tourist route" along with all the other tour buses. You travel in smaller groups (and smaller buses!) to allow you to get off the beaten track. You travel to less-frequented and more unique places that represent all that is wonderful about Ireland. We hope you'll come along for a truly memorable, insightful, and fun week of travel in Ireland! Of all my world travels, this was tops! I have traveled on my own, in large bus tours (never again after Inroads), and my Inroads experience is number one. Our guide went of his way to make the trip educational, entertaining while riding, and great craic when in towns. His energy and willingness to help was outstanding. Inroads Ireland's owners are Phil Ryan and Carolyn Janette. Phil is the Tour Designer, born and raised in Dublin, Ireland. He has worked for many years as a tour guide leading people to all corners of Ireland. Carolyn is the Director of Tours, born and raised in Milwaukee, Wisconsin (USA). She has always enjoyed traveling starting with family vacations in the station wagon to venturing off on her own to Asia, Australia, and Europe. After they married (check out the story below), Phil talked with Carolyn about all the amazing places in Ireland that travelers never get to simply because they are on back roads, may be difficult to find, or you'd need a smaller bus to take people there. He also talked about the fantastic small towns that bigger bus tour companies can't stay overnight in because there are simply not enough rooms. After having this conversation on more than one occasion, they had their 'ah-ha' moment while driving back from a weekend on the Mississippi River, looked at each other, and said "Let's start a tour business to do this!" And that was October 2005. Voile! 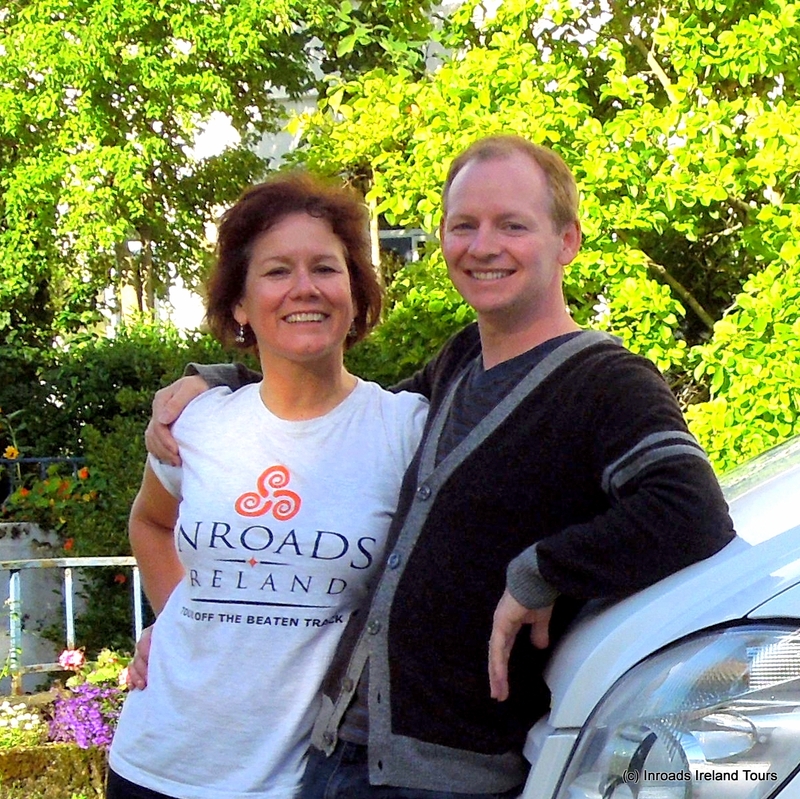 With Phil's years of Irish tour guiding experience and Carolyn's world travel expertise, Inroads Ireland was born. This tour company is for you, to provide you with the best Irish travel experience. Phil has a degree in Music and Recording Technology and has worked as an Audio Engineer and Producer. He enjoys traveling, kayaking, carpentry, playing guitar, camping, and hiking. Carolyn is a Registered Nurse and has a Master of Education in Health Education degree. She has worked in the areas of neuroscience nursing, teaching, electronic medical records software, public health, and project management. She enjoys traveling, seeing films, reading, puzzles, cooking, camping, and trying new sports. How did Phil and Carolyn meet? Carolyn decided to take some time off in 1999 and embarked on a 4-month solo backpacking European adventure. Sitting at a cafe in Nice, France in early June, Carolyn was contemplating her destination in early July. Head south to Rome or head north to Ireland? The decision was Ireland! Upon arriving at her London hostel in late June, she saw a sign for a backpacker's tour of Ireland. Sign her up! A week later she arrived in Dublin and she began her two weeks of traveling in northern and southern Ireland. On the southern half of the tour, Carolyn met the handsome tour guide, Phil. After the tour ended, they spent the day together in Dublin and Phil suggested meeting at the top of the Eiffel Tower in Paris before Carolyn headed back to America. While the Eiffel Tower is an absolutely wonderful place, Carolyn had been in and out of Paris several times on her trip and thought London may work better. London it is! A place (Hyde Park Hostel), a date (August 20), and a time (12 noon) was chosen 5 weeks later and both Phil and Carolyn arrived at the appointed hour! Love flourished and by June 2001, they were getting married barefoot on the beach in Maui, Hawaii. Where have Carolyn and Phil traveled to? We enjoy getting involved and volunteering in a variety of projects.